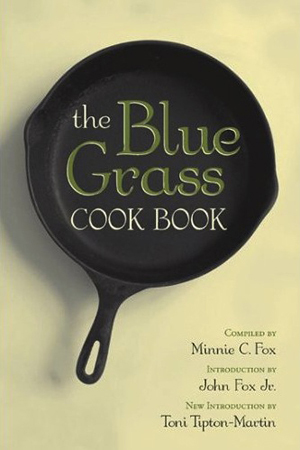 This fascinating cookbook was originally published in 1904 when Minnie C. Fox, a Kentucky socialite, compiled more than 300 recipes gathered from her family, friends and black cooks who lived near either her family estate in Bourbon County, Ky., or her home in Big Stone Gap, Va. The collection reflected authentic Southern cooking, prepared in turn-of-the-century kitchens where sorghum molasses, drop biscuits, succulent cured hams and decadent desserts were all commonplace. The recipes included such regional favorites as Johnny Cake, Baked Apple Dumplings, Green Corn Custard with Broiled Tomatoes, and even Mrs. Henry Clay’s Drop Cake. What makes this cookbook so exceptional is that the featured dishes are all placed in their proper historic context. A century ago, most collections that featured “fine old Dixie dishes” also included demoralizing etchings of slaves at work, vernacular language and occasionally lyrics from spirituals and hymns. The Fox family gave credit where credit was due, and with dignity provided redress to the black descendants of generations of invisible cooks who had worked to help define the culinary history of the South. Many of the recipes serve as interesting historical landmarks. Where else could you find instructions on how to dress terrapin? While most of us will never prepare turtle, many of the recipes still can be prepared in contemporary American kitchens using familiar ingredient and methods. The Coconut Pudding, Caramel Layer Cake, and Sweetbreads are fairly easy to prepare. When the New York Times reviewed this cookbook in 1904, the critic pointed out that many of the recipes are “veritable heirlooms, precious souvenirs of the past, the originals of which were in faded ink, just as they were inscribed by loving hands by our mothers and grandmothers.” He might have added that this collection is the next best things to observing the cooking in a traditional Southern kitchen more than 100 years ago.